BENUE NEWS: Full Text Of Gov Samuel Ortom's Remark At Launch Of Exercise "AYEM AKPATUMA"
Full Text Of Gov Samuel Ortom's Remark At Launch Of Exercise "AYEM AKPATUMA"
I wish to formally welcome the Chief of Army Staff, Lt. General Tukur Buratai and his entourage to Benue State for the flag-off of “Ayem Akpatuma”. 2. I must say that this is an important day in the life all Benue people because of the confidence which we have in the Nigerian Army in which thousands of our sons and daughters have served the nation. But for the commitment, dedication and professionalism of the Nigerian Army which was demonstrated during the Nigerian Civil War, the story of Nigeria would have been different today. 3. We cannot forget too what the Nigerian Army did to quell the Maitatsine crisis in Kano in the 1980s and are equally aware of the role the military is currently playing in containing the Boko Haram insurgency in the North Eastern part of the country. Hitherto, the once dreaded insurgents held sway in several Local Government Areas. Today, however, they have been degraded and have only been carrying out attacks on soft targets such as Churches, Mosques, Schools and Motor Parks. 4. 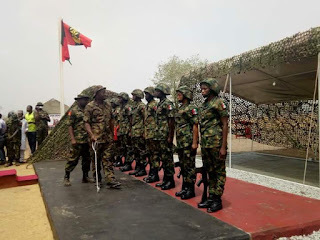 The Army’s recent Python Dance I and II in the South East which was deployed to contain the activities of the Indigenous Peoples of Biafra succeeded in achieving its objectives. These operations have contributed in keeping Nigeria one, safe and peaceful for development activities to take place. 5. 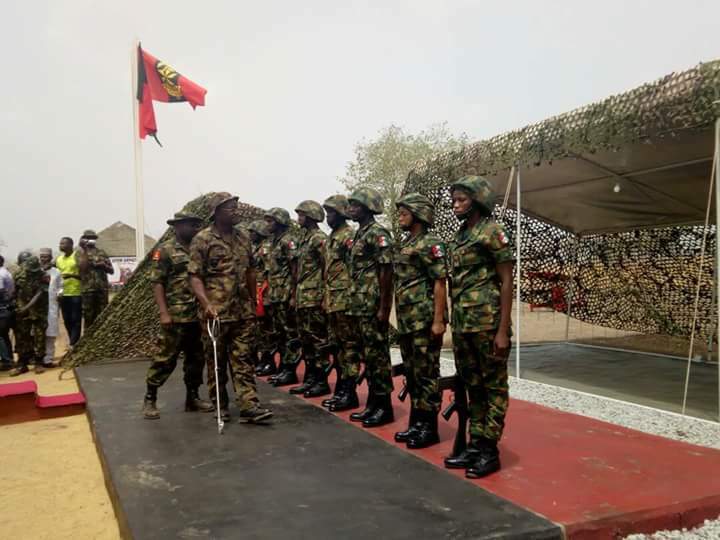 Distinguished Army Officers, Ladies and Gentlemen, we have been informed that the exercise we are gathered here for flag-off by the Chief of Army Staff, Lt. General Buratai is to be conducted in Benue, Kaduna, Kogi, Nasarawa and Taraba States. It is targeted at criminal activities and individuals who subvert peace and progress in the listed States. For us in Benue State, this exercise is unique because it is the first time that the menace of farmers and herdsmen crises is being confronted with the required attention and force that it truly deserves. I wish to commend Mr. President who is the Commander-in-Chief for this bold step. 6. After we lost over 73 innocent lives on 1st January, 2018 to herdsmen attacks, more lives were also lost in subsequent attacks after the burial. In Zamfara State, more than 40 people were also killed by Fulani herdsmen. This is besides the pockets of killings that have been going on in Nasarawa, Plateau, Taraba, Adamawa, Kaduna and many other States across Nigeria. To say the least, we cannot afford to go on like this as a Nation. It is for this reason that we welcome “Ayem Akpatuma” and call on all participants in the exercise to see it as crucial in the restoration of the confidence of victims in the country. 7. There have been hundreds of concerted attacks on several communities across Benue State since 2011. This development compelled us to find a lasting solution to the incessant clashes between farmers and herdsmen. Painstaking research and survey across the world led us to enact the Open Grazing Prohibition and Ranches Establishment Law 2017. The major objective of this Law is to foster peace between farmers and herders in accordance with international best practices in animal husbandry. We are optimistic that the flag-off of Operation “Ayem Akpatuma” will further bolster the implementation of this Law in the State. 8. Let me quickly assure the Army hierarchy that all our people within the area of this operation would fully co-operate with the Army. I wish to pledge that the State Government and all Benue people would cooperate with you to succeed in this historic military operation. 9. Finally, on behalf of the good people and Government of Benue State, I sincerely thankPresident Muhammadu Buhari, GCFR, Commander-in-Chief of the Nigerian Armed Forces, who has approved this military exercise with a view to once and for all stemming the farmers/herders crises in Benue State and across some states of Central Nigeria. 10. Once again, as we welcome the Nigerian Army here, we are hopeful that the activities of all the officers and the rank and file would be guided by utmost discipline, professionalism and strict adherence to the rules of engagements for the good of Nigeria. 11. Thank you all and God bless. 12. In God we trust.